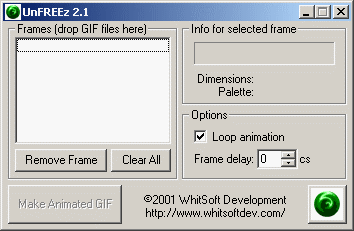 UnFREEz takes any number of separate GIF images and creates a single animated GIF. It supports automatic interlacing, transparency detection, and available looping and configurable animation delay. How to extract: Download the ZIP package and extract to a folder of your choice. Launch UnFREEz.exe. Is this program stealth (no writing at all to registry) or does it write some entries to the registry? Has anybody checked it? Version 2.1 tested successfully in Windows 7 (Professional, 32 bit). Tiny neat tool. It's too much poor. You need to load all the frames of your animation, its work is only to save the various frames in a unique gif file. excellant gif animater, and very lightweight on memory and hd space.